Secretion of anti-host proteins by Yersinia pestis via a type III mechanism is not constitutive. The process is tightly regulated and secretion occurs only after an appropriate signal is received. The interaction of LcrG and LcrV has been demonstrated to play a pivotal role in secretion control. Previous work has shown that when LcrG is incapable of interacting with LcrV, secretion of anti-host proteins is prevented. Therefore, an understanding of how LcrG interacts with LcrV is required to evaluate how this interaction regulates the type III secretion system of Y. pestis. Additionally, information about structure-function relationships within LcrG is necessary to fully understand the role of this key regulatory protein. In this study we demonstrate that the N-terminus of LcrG is required for interaction with LcrV. The interaction likely occurs within a predicted amphipathic coiled-coil domain within LcrG. Our results demonstrate that the hydrophobic face of the putative helix is required for LcrV interaction. Additionally, we demonstrate that the LcrG homolog, PcrG, is incapable of blocking type III secretion in Y. pestis. A genetic selection was utilized to obtain a PcrG variant capable of blocking secretion. This PcrG variant allowed us to locate a region of LcrG involved in secretion blocking. Our results demonstrate that LcrG interacts with LcrV via hydrophobic interactions located in the N-terminus of LcrG within a predicted coiled-coil motif. We also obtained preliminary evidence that the secretion blocking activity of LcrG is located between amino acids 39 and 53. Yersinia pestis, the causative agent of bubonic plague, harbors a large virulence plasmid that is essential for pathogenicity. This plasmid, called pCD1  in Y. pestis, encodes for a type III secretion apparatus necessary for the translocation of effector proteins (Yops) into eukaryotic target cells . The net result of this polarized toxin translocation is the disruption of eukaryotic cell signalling and structure . Induction of the virulence-related genes on pCD1 is linked to an in vitro phenomenon termed the Low Calcium Response (LCR). The LCR is believed to mimic the response of Y. pestis in contact with eukaryotic cells when calcium ions are removed from the growth medium at 37°C. The result of this in vitro induction of virulence genes is the massive secretion of Yops into the growth medium, accompanied by a characteristic growth restriction that is a hallmark phenotype of the LCR . Secretion of Yops by the type III secretion system is not constitutive. Control of secretion is complex and involves several proteins that positively and negatively regulate the activity of the secretion apparatus in response to environmental conditions . LcrG has been implicated in blocking the secretion apparatus either directly or indirectly , as strains lacking lcrG constitutively secrete Yops , regardless of inducing conditions. In addition, YopN, TyeA, SycN, YscB, LcrH, YopD, and LcrQ are all also required for the negative regulation of Yops secretion [6–17]. LcrV (the V antigen) is thought to positively regulate Yops secretion as lcrV strains do not secrete Yops, even under conditions that normally favor secretion [18, 19]. LcrG and LcrV have been demonstrated to physically interact in the bacterial cytoplasm . Disruption of the LcrG-LcrV interaction or overexpression of LcrG in a low-LcrV background both result in a constitutive blockage of Yops secretion [18, 20]. This evidence led to a model of how these two proteins may control Yops secretion. The LcrG-titration model theorizes that LcrG blocks the secretion apparatus (Ysc) from the bacterial cytoplasm and that interaction with LcrV is required to relieve the blockage. Upon induction by eukaryotic cell contact or removal of calcium from the growth medium, the intracellular level of LcrV becomes elevated relative to that of LcrG. The increased amount of LcrV removes LcrG from its secretion-blocking role, resulting in full induction of the LCR and secretion of Yops. Evidence accumulated to date clearly demonstrates that the LcrG-LcrV interaction is critical for the regulation of this complex virulence system [18, 20]. Therefore, dissection of the LcrG-LcrV interaction is warranted. Utilizing yeast two-hybrid analyses, we further investigated the LcrG-LcrV interaction. We determined that the N-terminus of LcrG is essential for LcrV interaction. The smallest linear region of LcrG required for the interaction is predicted to form a coiled-coil motif, a structure often associated with protein-protein interactions. We used both alanine-scanning and a 'radical' site-directed mutagenesis strategy to identify amino acids critical for the interaction within this region of LcrG. While alanine mutants failed to disrupt the LcrG-LcrV interaction, radical mutations of three residues revealed a region important for the interaction. These residues are likely to reside on the same face of the protein if a coiled-coil structure is assumed. Based on this evidence, we predict that the interaction of LcrG with LcrV occurs within an N-terminal coiled-coil domain of LcrG via hydrophobic interactions. Additionally, we investigated whether the Pseudomonas homolog of LcrG, PcrG, could transcomplement an lcrG strain of Y. pestis. The opportunistic pathogen Pseudomonas aeruginosa utilizes a type III secretion system for intracellular delivery of toxins [21–23] that is the most similar to the Yersinia system . Several components of the Pseudomonas system have been demonstrated to functionally complement genetic defects in the Yersinia homologs including the LcrV homolog, PcrV [24, 25]. Homologs of LcrG and LcrV (i.e., PcrG and PcrV) have only been identified in P. aeruginosa, suggesting that this pair of regulatory proteins may fulfill similar roles in these extracellular pathogens. In the present study, we found that PcrG could not substitute for LcrG, although both proteins interacted with LcrV. This result led to a genetic selection for PcrG variants that could transcomplement an lcrG defect. Isolation of a PcrG variant that could substitute for LcrG led to the identification of a region within LcrG that may be involved in blocking the activity of the Y. pestis type III secretion system. 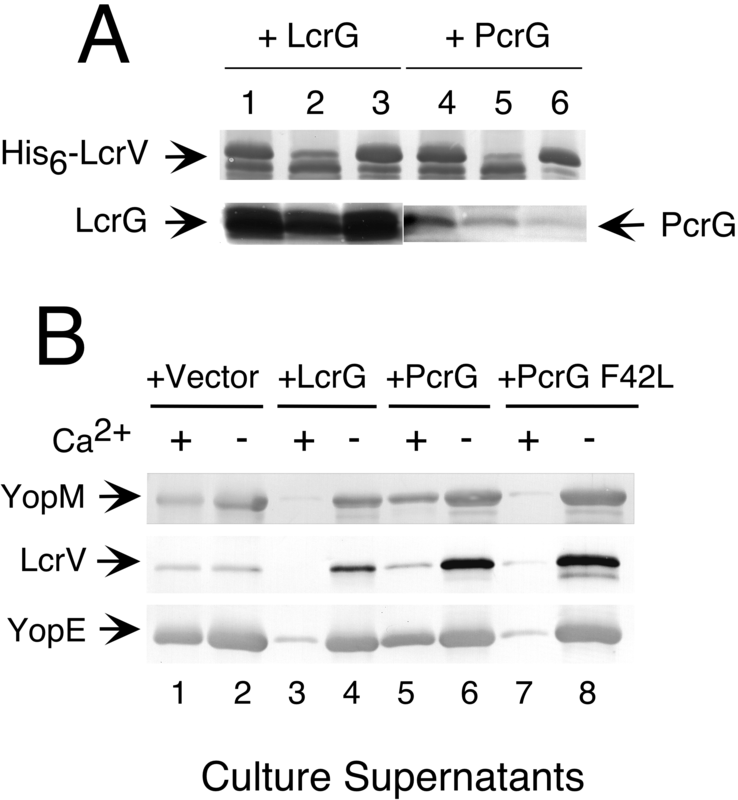 LcrG and LcrV physically interact in Y. pestis , and that interaction plays a significant role in the regulation of Yops secretion . LcrG and LcrV interact in a yeast two-hybrid assay , therefore this technique was used to further investigate the region of LcrG required for its interaction with LcrV. Truncations of LcrG were constructed and fused to the GAL4 activation domain of pACT2. These plasmids were co-transformed into yeast strain Y187 with full-length LcrV fused to the GAL4 DNA binding domain of plasmid pAS2-1 to determine if the LcrG truncations could continue to participate in an interaction with LcrV. Using a filter-lift assay as a qualitative determination of an interaction and a liquid β-galactosidase assay to quantify the results, we found that the LcrV-interaction domain of LcrG lies in the N-terminus of the protein. The smallest linear region of LcrG that was still capable of interacting with LcrV was determined to be amino acids 7–40 (Fig. 1; shown highlighted in yellow in Fig. 2). Deletion of five additional amino acids from the N-terminus of the 7–40 construct or seven amino acids from the C-terminus of the 7–40 construct eliminated our ability to detect an interaction using this system (Fig. 1). Interestingly, this approximate region of LcrG (amino acids 7–35) is predicted to form a coiled-coil domain when LcrG is analyzed using the COILS algorithm  (data not shown). These results suggest that the LcrG-LcrV interaction requires the N-terminus of LcrG and may involve a coiled-coil domain. Schematic representation of LcrG truncations fused to the GAL4 activation domain of plasmid pACT2. All constructs were cotransformed with full-length LcrV cloned into cyh2-deleted pAS2-1 to produce a GAL4-DNA binding domain-LcrV chimera in S. cerevisiae strain Y187. The ability of each truncation to bind LcrV was determined qualitatively by X-gal hydrolysis from filter-lift assays and quantitatively by the level of β-galactosidase activity expressed as Miller units in yeast liquid cultures. Final β-galactosidase activities are calculated from the average of at least four independent measurements. Pairwise BLAST alignment of LcrG and PcrG. Amino acid sequence alignment of LcrG from Y. pestis (NCBI RefSeq, NP_395166; http://www.ncbi.nlm.nih.gov:80/entrez/query.fcgi?cmd=Retrieve&db=protein&list_uids=16082720&dopt=GenPept) and PcrG from P. aeruginosa (NCBI RefSeq, NP_250396; http://www.ncbi.nlm.nih.gov:80/entrez/query.fcgi?cmd=Retrieve&db=protein&list_uids=15596902&dopt=GenPept). Overall the two proteins are 43% identical and 56% similar. The sequences were aligned using the BLAST algorithm as implemented for pairwise alignments . The region highlighted in yellow (amino acids 7–40) is the smallest region identified that interacts with LcrV. The region in blue (amino acids 39–53) corresponds to a previously described deletion that eliminated secretion blocking activity . The amino acids identified with red asterisks are residues identified as participating in the LcrG-LcrV interaction (A16, S23, and L30). The residue marked with the blue asterisk (F48) is required for secretion blocking activity of LcrG. To determine individual residues of LcrG required for interaction with LcrV, a systematic site-directed mutagenesis strategy was used to change conserved or charged residues within the delineated interaction region. Initially, alanine-scanning mutagenesis was used for this study as alanine substitutions are generally thought to minimally effect protein folding . Sequence conservation from the alignment of LcrG with the Pseudomonas aeruginosa homolog, PcrG (Fig. 2), allowed the targeting of specific residues likely to be important for the interaction. After construction of specific missense mutants, each full-length LcrG alanine variant was screened for interaction with LcrV using the yeast two-hybrid assay. Surprisingly, the alanine-scanning mutagenesis results failed to demonstrate amino acids of LcrG involved in the LcrG-LcrV interaction. All of the alanine mutants screened were capable of interaction with LcrV as demonstrated in a filter-lift assay. Liquid β-galactosidase assays showed that the strength of the interactions were not significantly reduced from that of wild-type LcrG (Table 1). These results showed that single alanine substitutions are insufficient to disrupt the LcrG-LcrV interaction. A likely explanation for the failure of alanine-scanning to reveal residues in LcrG important for LcrV interaction is that alanine is a residue capable of interaction with hydrophobic residues. Our subsequent studies suggest that the interaction of LcrG with LcrV occurs at a hydrophobic patch within LcrG. Two hybrid analysis of alanine site-directed mutants of LcrG (residues 7–40) with LcrV. aβ-galactosidase activity is expressed as Miller Units ± standard error of the mean. bThis value is derived from yeast expressing LcrG and an empty vector control. Based on our experience with the alanine-scanning combined with the similar results of Francis et. al , it seemed likely that the LcrG-LcrV interaction was occurring between hydrophobic residues. Accordingly, we continued to examine the interaction domain using a mutagenesis strategy described by Francis, et al. termed 'radical' site-directed mutagenesis . This method involves replacing hydrophobic residues with charged residues, or changing charged residues to oppositely charged residues. This method was used to mutagenize several conserved residues in the interacting region in the effort to disrupt the LcrG-LcrV interaction (Table 2). These 'radical' site-directed mutants were then screened using the yeast two-hybrid system for their interaction with LcrV. Radical mutagenesis revealed several residues with decreased β-galactosidase activity in the yeast two hybrid system. The LcrG mutants A16R, A16D, S23R, and L30R all had significantly decreased activity when assayed for β-galactosidase expression (Table 2). LcrG mutants I20R, A27E, and I37R demonstrated somewhat decreased activity (Table 2). These results suggested that residues A16, S23, and L30 (red asterisks in Fig. 2) all participate in the interaction of LcrG with LcrV and that residues I20, A27, and I37 may also contribute to the interaction. Of the residues identified in these experiments, only changes to A16, S23, and L30 were detected with a more sensitive filter-lift assay for β-galactosidase activity and were therefore chosen for further characterization. Two hybrid analysis of 'radical' site-directed mutants of LcrG (residues 7–40) with LcrV. The alanine at position 16 was previously identified as a critical residue in the LcrG-LcrV interaction . Two mutations were characterized at this position (A16R and A16D) and they failed to interact with LcrV, showing that single substitutions of this kind can disrupt the LcrG-LcrV interaction . Additional data from this study showed that a substitution of the leucine at position 30 with an arginine also prevented the LcrG-LcrV interaction in yeast (Table 2). Interestingly, when L30 is replaced with alanine (Table 1) or threonine (Table 2), the interaction is not effected. Mutagenesis of the serine at position 23 to arginine resulted in an LcrG variant that weakly interacted with LcrV as determined by a filter-lift assay for β-galactosidase activity. The color change of the yeast colonies due to the hydrolysis of 5-bromo-4-chloro-3-indolyl-β-D-galactopyranoside (X-gal) by β-galactosidase was significantly delayed and less intense than the reaction we observed for strongly interacting mutants. The liquid β-galactosidase assay confirmed that the strength of the LcrG S23R-LcrV interaction was reduced (Table 2), indicating that this residue is likely involved in the interaction of LcrG with LcrV. 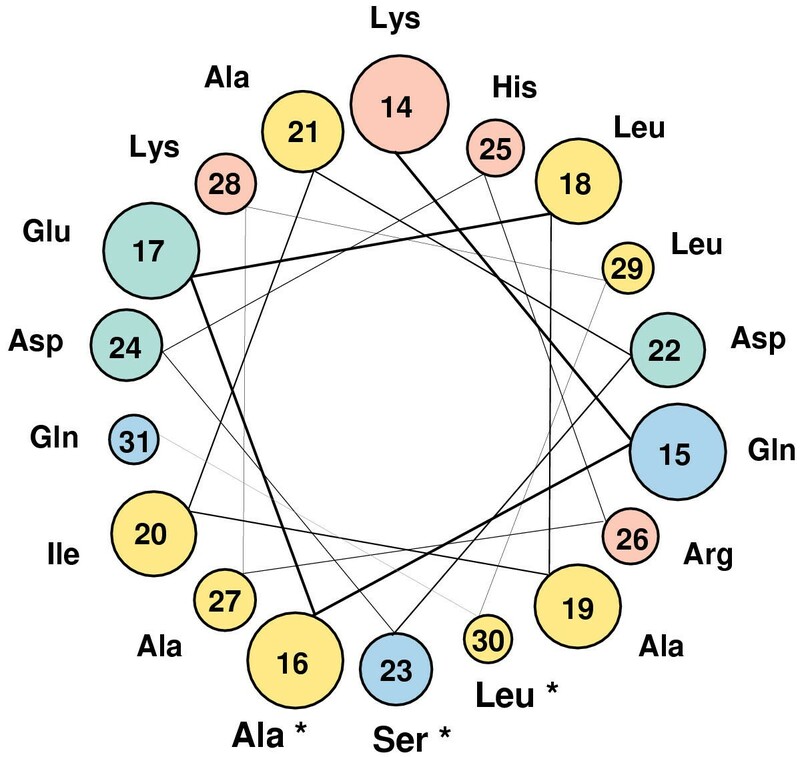 As coiled-coil motifs show a characteristic seven amino acid repeat pattern, with each repeat representing two turns of the α-helix, it is interesting that three positions identified as important to the LcrG-LcrV interaction (16, 23, and 30) are each separated by seven amino acids. When this region was analyzed using a helical wheel projection, the three residues fall on the same face of the helix, which appears to be largely hydrophobic in nature (Fig. 3). These results and observations further indicate that the LcrG-LcrV interaction may require the participation of a coiled-coil motif and occurs at a largely hydrophobic interface. Helical wheel projection of residues 14–31 of LcrG. Residues 14 to 31 of LcrG are shown in a helical wheel projection created with the WheelApp applet; http://cti.itc.Virginia.EDU/~cmg/Demo/wheel/wheelApp.html. Basic residues are shown in pink, acidic residues in green, neutral amino acids in blue, and hydrophobic amino acids in yellow. Residues in LcrG that are critical for LcrV interaction are designated with an asterisk. To evaluate the biological significance of the changes in interaction seen in the yeast two-hybrid system between LcrV and LcrG S23R or LcrG L30R, LcrG S23R and L30R were expressed in lcrG Y. pestis where their ability to control Yops secretion was examined. Neither the S23R or the L30R mutant displayed the calcium-independent growth phenotype previously observed for LcrG A16R . LcrG S23R displayed a wildtype growth and secretion phenotype while LcrG L30R was Ca2+-blind (data not shown). To further understand the phenotypes obtained, the ability of LcrG S23R and L30R to interact with LcrV was examined in Y. pestis. Wild type LcrG, LcrG S23R, LcrG L30R, and LcrG A16R were independently co-expressed with His6-tagged LcrV in a strain of Y. pestis deleted for lcrGV. The cells were French pressed and the cleared lysates were applied to Talon columns to purify His6-tagged LcrV. As previously reported , LcrG copurified with LcrV and LcrG A16R did not copurify with LcrV (Fig. 4, lanes 3 and 12). When LcrG S23R was coexpressed with His6-tagged LcrV, a small amount was recovered in the elution fraction from the column (Fig. 4, lane 6). This result is indicative of a weaker interaction between LcrG S23R and LcrV than the interaction between wildtype LcrG and LcrV. The weaker interaction seen in Y. pestis between LcrG S23R and LcrV corresponds with our yeast two-hybrid data for the S23R mutant, which showed an interaction with LcrV, and suggests an interaction with decreased affinity (Table 2). The interaction results for LcrG S23R provide an explanation for the failure of LcrG S23R to confer a Ca2+-independent phenotype like the previously described LcrG A16R mutant. LcrG S23R still interacts with LcrV and therefore LcrV can neutralize the LcrG-mediated secretion block. In fact, this result is consistent with the fact that very low levels of LcrG are required to provide LcrG function . LcrG L30R either interacts weakly with or does not interact with His6-tagged LcrV in Y. pestis (Fig. 4, lane 9). This result also corresponds with the lack of interaction observed in the yeast two-hybrid assay for this mutant. Taken together, these results suggest that the residues found to be involved in the LcrG-LcrV interaction using two-hybrid analysis are relevant in the bacterial cell. However, the inability of L30R to function like our previously described A16R mutant was somewhat surprising. One explanation is that the protein with the L30R change is simply misfolded. The second explanation is that the secretion-blocking and the LcrV-interaction domains of LcrG overlap. Currently we do not possess the data required to differentiate between the two possibilities and we are pursuing the reasons for the failure of L30R to function like wildtype LcrG. 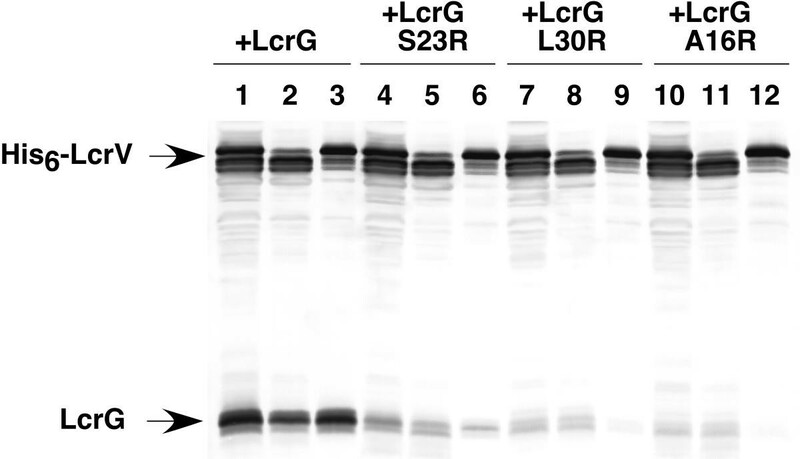 Copurification of LcrG variants with His6-tagged LcrV. Cells of Y. pestis KIM8-3002.8 (ΔlcrGV2) containing plasmids pAra-HT-V and pAraG18K (lanes 1 to 3), pJM131 (LcrG S23R) (lanes 4 to 6), pJM99 (LcrG L30R) (lanes 7 to 9), or pJM89 (LcrG A16R) (lanes 10 to12) were grown in TMH with calcium and induced with 0.2% (wt/vol) arabinose prior to temperature shift to 37°C. Cultures were harvested after 4 h of growth at 37°C, and cellular extracts were disintegrated using a French press (20,000 lb/in2). Unbroken cells and large debris were removed by centrifugation (14,000 × g) for 10 min and the cleared extracts (lanes 1, 4, 7, and 10) were applied to a Talon column. Proteins that did not bind were collected as the flowthrough fraction (lanes 2, 5, 8, and 11). Proteins were eluted from the column with 50 mM imidazole and collected (lanes 3, 6, 9, and 12). All protein samples were resolved by SDS-PAGE in a 12.5% polyacrylamide gel after dilution in 2X SDS sample buffer and analyzed by immunoblotting with α-LcrG and α-LcrV. Proteins were visualized by probing with alkaline phosphatase-conjugated secondary antibodies and developing with NBT-BCIP. Because the residues of LcrG required for interaction with LcrV are strongly conserved in PcrG of P. aeruginosa (red asterisks in Fig. 2), we determined if PcrG could interact directly with LcrV. First, PcrG-GAL4-AD and LcrV-GAL4-BD chimeras were coexpressed in a yeast two-hybrid assay. Activation of β-galactosidase by the chimeric proteins was demonstrated by a filter-lift assay showing that LcrV and PcrG interact (data not shown). To determine if PcrG and LcrV also interacted in Y. pestis, we attempted to copurify the two proteins from bacterial extracts. PcrG and His6-LcrV were coexpressed in a Y. pestis strain with lcrG and lcrV deleted and the cleared lysates were applied to a Talon column. PcrG reacts weakly with antibody to LcrG, allowing us to detect the presence of PcrG on immunoblots. PcrG was present in the elution fraction (Fig. 5A, lane 6), indicating that PcrG was retained on the Talon column. This result demonstrated that PcrG and LcrV interact in Y. pestis. The interaction of PcrG with LcrV supports the mutagenesis and sequence data indicating that residues conserved between LcrG and PcrG are likely to be important for interaction with LcrV. PcrG interacts with LcrV, but is incapable of blocking Yops secretion. (A) Cells of Y. pestis KIM8-3002.8 (Δ lcrGV2) containing plasmids pAra-HT-V and pAraG18K (lanes 1 to 3) or pJM132 (lanes 4–6) were grown in TMH and harvested as described for Fig. 4. The cleared cellular extracts (lanes 1 and 4) were applied to a Talon column and proteins that did not bind were collected as the flowthrough fraction (lanes 2 and 5). Proteins were eluted from the column with 50 mM imidazole and collected (lanes 3 and 6). Protein samples were resolved by SDS-PAGE in a 12.5% polyacrylamide gel and analyzed by immunoblotting with α-LcrG and α-LcrV. (B) Cells of Y. pestis KIM8-3002.8 (ΔlcrGV2) containing plasmids pBAD18-Kan (vector; lanes 1 and 2), pAraG18-K (+LcrG; lanes 3 and 4), pJM132 (+PcrG; lanes 5 and 6), and pJM133 (+PcrG F42L) were grown in TMH with or without calcium. Arabinose was added to 0.2% (wt/vol) to each of the cultures immediately prior to temperature shift to 37°C to induce the expression of LcrG, PcrG, or PcrG F42L from the plasmids. Cultures were harvested after 4 h of growth at 37°C, and samples were fractionated into whole-cell and cell-free culture supernatants. Culture supernatant samples were separated by SDS-PAGE in a 12.5% polyacrylamide gel and analyzed by immunoblotting with α-YopM, α-LcrV, and α-YopE. Proteins were visualized by probing with alkaline phosphatase-conjugated secondary antibodies and developing with NBT-BCIP. Since PcrG and LcrV interacted in Y. pestis, the ability of PcrG to complement an lcrG strain of Y. pestis was examined. Cultures of lcrG strains transcomplemented with either LcrG or PcrG were grown in the presence and absence of calcium and harvested after four hours of growth at 37°C. Culture supernatants were examined for the presence of secreted proteins by immunoblotting for LcrV, YopE, and YopM. Fig. 5B shows that LcrG expression blocked secretion in this strain in the presence of calcium and allowed secretion in its absence (Fig. 5B, lanes 3 and 4). However, when PcrG was expressed, secretion was not blocked in either the presence or absence of calcium (calcium-blind phenotype) similar to the parent strain (Fig. 5B, lanes 5 and 6). Therefore, while PcrG is capable of interacting with LcrV, it differs from LcrG in its ability to block secretion of Yops in Y. pestis. PcrG of P. aeruginosa can interact with LcrV, but cannot block secretion of Yops in Y. pestis (Fig. 5B). This result suggested that mutagenesis of pcrG could be used to isolate PcrG mutants capable of blocking Yops secretion in Y. pestis. This genetic screen allowed the isolation of PcrG mutants that functioned in Y. pestis in a manner indistinguishable from LcrG (Fig. 5B, compare lanes 7 and 8 to lanes 3 and 4). DNA sequencing of seven independent isolates revealed the presence of a phenylalanine to leucine change at position 42 of PcrG in all seven of the isolates. This result suggests that a region of PcrG including amino acid 42 is capable of interaction with Y. pestis secretion components and suggests that the homologous LcrG region is likely to be involved in LcrG's secretion-blocking activity. Change of residue 42 in PcrG from phenylalanine to leucine made the PcrG sequence look more like that of LcrG. That is, position 42 of PcrG became identical to the corresponding LcrG residue (L39) (Fig. 2, boxed residues). This information suggested that residue 39 of LcrG was an ideal candidate for site-directed mutagenesis to disrupt LcrG's secretion blocking activity. Accordingly, the leucine at position 39 in LcrG was mutated to both phenylalanine and arginine. Surprisingly, neither mutant LcrG protein L39F (data not shown) or L39R (Fig. 6B, lanes 5 and 6) effected LcrG function. Subsequent mutagenesis of the phenylalanine at position 48 of LcrG to arginine resulted in an LcrG mutant (F48R, blue asterisk in Fig. 2) that was defective for secretion blocking activity (Fig. 6B, lanes 7 and 8). Mutation of F48 to either alanine or leucine had no effect on the function of those LcrG variants, suggesting that the hydrophobic nature of F48 is important for LcrG function. The expression level of LcrG and LcrG F48R from our plasmid constructs were also analyzed in whole cell extracts. LcrG F48R was expressed as well as wild type LcrG, demonstrating that its inability to block secretion is not due to a change in the expression or stability of the protein (Fig. 6A, lanes 3–4 and 7–8). An interesting point to note is that when Skrzypek and Straley deleted residues 39–53 of LcrG (highlighted in blue in Fig. 2), they obtained a mutant protein that did not block Yops secretion . The LcrG F48R mutant, like the Δ39–53 mutant, interacts with LcrV (data not shown and ), demonstrating that the protein likely folds in a native conformation. Additionally, the mutant confirms previous work that the two known LcrG functions (secretion blocking and LcrV interaction) are genetically separable . Further experiments will more precisely delineate the region of LcrG required to block the type III secretion apparatus. Identification of an LcrG residue required for secretion blocking activity. Cells of Y. pestis KIM8-3002.8 (ΔlcrGV2) containing plasmids pBAD18-Kan (vector; lanes 1 and 2), pAraG18-K (+LcrG; lanes 3 and 4), pJM143 (+L39R; lanes 5 and 6), and pJM144 (+F48R; lanes 7 and 8) were grown in TMH with or without calcium. Arabinose was added at 0.2% (wt/vol) to each of the cultures immediately prior to temperature shift to 37°C to induce the expression of the LcrG variants from the plasmids. Cultures were harvested after 4 h of growth at 37°C, and samples were fractionated into whole-cell (A) and cell-free culture supernatants (B). Samples were separated by SDS-PAGE in a 12.5% polyacrylamide gel and analyzed by immunoblotting with α-YopM, α-LcrV, α-YopN, α-YopD, α-YopE, and α-LcrG. Proteins were visualized by probing with alkaline phosphatase-conjugated secondary antibodies and developing with NBT-BCIP. The interaction of LcrG with LcrV is a critical factor in controlling the activity of the type III secretion system in Y. pestis. In order to gain a deeper understanding of this critical interaction, we determined the region of LcrG required for interaction with LcrV. Results presented in this study demonstrate that the smallest linear region of LcrG required for interaction with LcrV is residues 7 to 40 (highlighted in yellow in Fig. 2). Interestingly, this region is predicted to form a coiled-coil domain. We have identified several residues (indicated with red asterisks in Fig. 2) within the interacting region of LcrG that contribute to the interaction with LcrV. When residues 7 to 40 of the protein are analyzed with a helical wheel projection, these three residues (A16, S23, and L30) appear to lie on one face of an amphipathic helix (Fig. 3). The seven amino-acid periodicity of the residues is consistent with a coiled-coil protein motif. These data strongly suggest the LcrV-interaction domain of LcrG is contained within an amphipathic coiled-coil domain. Additionally, we exploited the inability of PcrG to block secretion in Y. pestis as a point to start mapping the region of LcrG required for blocking the type III secretion apparatus. We found that mutation of residue 42 in PcrG (boxed in Fig. 2) allowed the protein to function in Y. pestis. This information, coupled with a previous observation that deletion of residues 39 to 53 within LcrG (highlighted in blue in Fig. 2) abolished the secretion-blocking activity , allowed us to identify amino acid 48 as a residue (blue asterisk in Fig. 2) required to block the activity of the Y. pestis type III secretion apparatus. Yersinia pestis, Pseudomonas aeruginosa, Escherichia coli, and Saccharomyces cerevisiae strains used are listed in Table 3. Y. pestis strains were grown in heart infusion broth or on tryptose blood agar base medium (Difco Laboratories, Detroit, MI) at 26°C for genetic manipulations. For physiological studies, growth of Y. pestis was conducted in a defined medium, TMH, as previously described . E. coli strains were grown in Luria-Bertani medium or agar  at 37°C. When appropriate, bacteria were grown in the presence of antibiotics, which were used at 50 μg/ml for both carbenicillin and kanamycin. Strains and plasmids used in this studya. a Numerous plasmids used for two hybrid analysis of LcrG site-directed mutants are not listed here to conserve space. All plasmids are available upon request. b Amino acids of LcrG included in the construct are indicated. c Amino acid substitutions are indicated. Plasmid DNA was isolated using a QiaPrep Spin kit (Qiagen, Inc., Studio City, CA). Cloning methods were essentially as described previously . PCR fragments were purified using the QiaQuick PCR purification kit (Qiagen). Transformation of DNA into E. coli was accomplished by using commercially obtained competent cells (Novagen, Madison, WI). Electroporation of DNA into Y. pestis was done as described previously . Gene amplification was performed with DeepVent (New England Biolabs, Beverly, MA) or Taq (Eppendorf Scientific, Westbury, NY) DNA polymerase in a Perkin-Elmer GeneAmp Model 2400 thermocycler (Applied Biosystems, Foster City, CA). Site-directed mutagenesis was performed with PfuTurbo DNA polymerase (Stratagene, La Jolla, CA) using the QuikChange Site-directed Mutagenesis Kit (Stratagene) according to the manufacturer's instructions. Complementary oligonucleotides were designed to contain the desired mutation, flanked by unmodified sequence to anneal to the same sequence on opposite strands of the template plasmid. Oligonucleotide primers were synthesized by MWG Biotech (High Point, NC). pACTG was used as the template for all plasmids listed in Table 1 and Table 2. pAraG18K was used as the template for pJM99, pJM131, pJM143, and pJM144. All mutations were confirmed by sequence analysis (MWG Biotech). The sequences of all mutagenic oligonucleotides are available upon request. Plasmids used in this study are described in Table 3. All plasmids expressing truncations of LcrG (pJM1, pJM2, pJM3, pJM4, pJM5, pJM23, pJM52, and pJM53) were constructed by cloning Bam HI- and Nco I-cleaved PCR products into pACT2. pJM110 was constructed by cloning a Bam HI- and Nco I-cleaved PCR product of pcrG into pACT2. Plasmid pJM127 was constructed by cloning an Eco RI-cleaved PCR p6roduct of pcrG into Eco RI- and Sma I-cleaved pBAD18. pJM127 was digested with Eco RI and Xba I to release a pcrG fragment that was subsequently subcloned into EcoRI- and XbaI-cleaved pBAD18-Kan to create pJM132. The sequences of all oligonucleotide primers are available upon request. To facilitate the selection of PcrG variants that functioned to block Yops secretion (see below), the virulence plasmid, pCD1, of the lcrG Y. pestis strain KIM8-3002.7 was tagged with a kanamycin resistance cassette to select for its presence. pCD1 in KIM8-3002.7 was tagged with the mini-Tn5 derived transposon EZ::Tn™ <R6Kγori/KAN-2> (Epicentre Technologies, Madison WI) according to the manufacturer's instructions to obtain KIM8-3002.7.MN1. Location of the insertion was not determined but the LCR phenotype and ability to translocate Yops into HeLa cells was verified (data not shown). Yeast two-hybrid assays were performed as recommended by the commercial supplier (Clontech, Palo Alto, CA). Vectors pAS2-1 (encoding the GAL4 DNA binding domain) and pACT2 (encoding the GAL4 activation domain) were obtained from Clontech Laboratories as part of the Matchmaker Two-Hybrid System 2 Kit. Plasmids were transformed into Saccharomyces cerevisiae strain Y187 by using the Frozen-EZ Yeast Transformation II kit (Zymo research, Orange, CA) and plated on appropriate minimal yeast synthetic-dropout medium plates. Colony filter-lift assays to detect β-galactosidase activity were performed as described by Clontech laboratories. Liquid β-galactosidase assays were performed using the Yeast β-galactosidase Assay Kit (Pierce, Rockford, IL) according to the manufacturer's instructions. β-galactosidase units were calculated as described previously . Error-prone PCR was used to mutagenize pcrG for selection of PcrG variants that could block Yops secretion in an lcrG background (KIM8-3002.7.MN1). Mutazyme (Stratagene, La Jolla, CA) was used to amplify PcrG for cloning into pBAD18 . The ligation reaction was electroporated into lcrG Y. pestis (which is temperature sensitive due to its Ca2+-blind phenotype) and the cells were plated on TMH medium  containing arabinose, Ca2+, kanamycin and carbenicillin. Transformants that grew at 37°C were streak purified and checked for phenotype by determining Ca2+-dependence, which suggests restoration of "LcrG function" by PcrG. Ca2+-dependent strains were subsequently used for plasmid isolation. Isolated plasmids were re-electroporated into an unmutagenized background and the strains were re-evaluated for growth at 37°C and secretion of Yops. Bacterial cells were fractionated as previously described . Briefly, bacterial cells were chilled on ice after growth, harvested by centrifugation, and washed in cold phosphate-buffered saline (PBS; ). Bacterial whole cell fractions were prepared by resuspending the washed cells in cold PBS and precipitating total proteins with 10% (vol/vol) trichloroacetic acid (TCA) on ice overnight. Secreted proteins were recovered from the bacterial growth medium by centrifuging the spent medium a second time, transferring the supernatant to a clean tube, and precipitating with 10% (vol/vol) TCA on ice overnight. The TCA-precipitated proteins were pelleted by centrifugation (20,800 × g at 4°C) for 20 min and resuspended in 2X sodium dodecyl sulfate (SDS) sample buffer . Protein extracts for affinity-purification were prepared by disintegration with a French press. Ice-cold yersiniae were resuspended in ice-cold PBS and passed through a French pressure cell at 20,000 psi. Following disintegration, the extracts were clarified by centrifugation at 20,800 × g for 10 min at 4°C. Affinity purification with His6-LcrV was performed using Talon resin (Clontech) as described by the manufacturer. Proteins were separated by SDS-polyacrylamide gel electrophoresis (SDS-PAGE), using 12.5 % (wt/vol) polyacrylamide gels according to the method of Laemmli . Samples were boiled 3–5 min before loading on the gels. Samples were loaded such that lanes containing different culture fractions represented equivalent amounts of the original cultures. Proteins resolved by SDS-PAGE were transferred to Immobilon-P membranes (Millipore Corp., Bedford, MA) using carbonate transfer buffer (pH 9.9) . Specific proteins were visualized using rabbit polyclonal antibodies specific for glutathione S-transferase (GST)-tagged LcrG (α-LcrG) , His-tagged LcrV (α-LcrV) , YopM (α-YopM) , GST-tagged LcrQ (α-LcrQ) , YopN (aka LcrE) (α-LcrE ), His-tagged YopD (α-YopD) , and YopE (α-YopE; gift from S. C. Straley, University of Kentucky, Lexington, KY. Alkaline phosphatase-conjugated secondary antibody (goat anti-rabbit immunoglobulin G; Pierce) was used to visualize proteins by development with nitroblue tetrazolium and 5-bromo-4-chloro-3-indolylphosphate (NBT-BCIP; Fisher Scientific, Fair Lawn, NJ). This work was supported in part by funds from North Dakota EPSCoR and the UND School of Medicine. J. S. M. was supported by a pre-doctoral fellowship from ND EPSCoR. The authors thank David S. Bradley (University of North Dakota) for critical reading of the manuscript. J.S.M. performed all of the studies described and wrote the draft of the manuscript. M. L N. conceived of the study, supervised the work, and edited the manuscript.